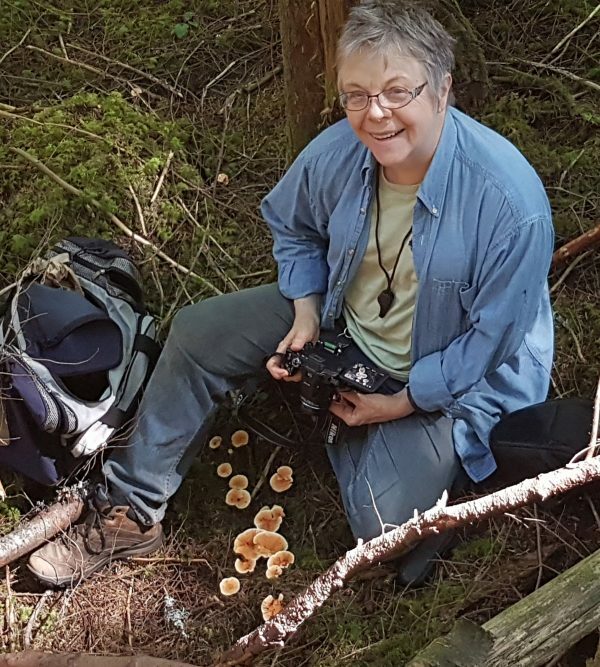 When my husband and I knew we’d be moving to BC’s Sunshine Coast and building a home in the middle of a rainforest, I decided it was time to learn about mushrooms – like so many people, I’d been conditioned to just stay away from fungi because they were so deadly. So I took some courses and obtained some reliable reference books, and now I look forward to each year’s rainy season and the fascinating wonders it brings. Somewhere along the way, I heard about the International Fungi & Fibre Symposium. When I learned it would be held in Mendocino, California, in January of 2008, I knew I had to go. And I’m so glad I did: not only did I spend a week surrounded by people who were just as crazy about mushroom dyeing as I was, I learned more about the whole subject than I ever thought possible. Autumn is now a time for searching, gathering, and experimenting, and I’m getting some wondrous results (you might even say I’m obsessed. I’ll share what I’m learning through this blog. In the fall of 2016, shortly before the Symposium began, I was interviewed by Sheryl MacKay of CBC’s North by Northwest. You can listen to the podcast here—my interview starts at around 17 minutes in. ArtsQuest.ca made a video of my studio during a visit in 2014—go to the bottom of their page for the video, and watch for a fleeting glimpse of Rica, our speed-demon Border Collie! I am very interested in using fungi in dying fabrics (paticularly wool). Thanks for your postings! Hi Deb – Thanks for your comment – glad to hear someone else is hooked on dyeing with mushrooms! Whereabouts are you? I’m planning on giving another dyeing workshop this fall, so I’m eagerly awaiting mushroom season (and hoping for some good summer rains!). After admiring your mushroom bowls at the container show at Fibreworks I was glad to see you had a website to explain your process. I am writing an article about Fibreworks for Coast Life magazine and would like to include a mention of the Shroomworks…A picture would be good, too, but when I took one at the gallery it was a tad out of focus–maybe the texture gave it an incorrect reading? Anyway, if you have a high res jpg image that you could send me for the magazine, that would be great. I spend some time in southern Auvergne every year and was very lucky to find some polyporus tinctorius on some trees in the area. I tried dyeing with them . Got the colors shown in Cardon’s book but brighter yellows .I have 3 photos you might be interested in seeing .Just give me your email if you want me to send them to you . I am absolutely intriged with your mushroom dyeing, especially your results from the lobster mushroom! Did you change the pH of your dyebath at all, or did you get those lucious colors just from using a neutral bath? Did you use any mordants, or was the difference in color strength just from subsequent turns in the pot? Thanks for sharing all your lovely results on your blog. Very inspiring! Thanks – I, too, remain fascinated by what mushrooms can give in the dyepot. I use alum for all my lobster dyeing – I’ve tried copper and iron, and they made very little difference. But I do like to play with the pH – an acid afterbath (pH3) brings out the orange, while a ph11 gives more of a purple cast to the colour. I’ve added a Lobster Mushroom category to my blog to make it easier to find the post from last year where I show the results of changing the pH. I like using lobsters in public demonstrations – just a few minutes of boiling the parings brings out the rich colour, and the changes from shifting the pH are immediate. I’m interested in the process you use to “mordant” the samples – I’m planning on doing some silk scarves. Can you tell me if you use a particular amount of vinegar or washing soda in your process or if you use litmus paper (or another mechanism) to gauge the PH level? For your boiling pots, how long do the mushrooms typically boil before they begin to release their color? Does the water require maintaining a particular temperature point to be successful? The samples are beautiful – I can’t wait to try this out. I mordant most of my samples with alum, typically 10% of the weight of the dry fibre. You can also add a bit of cream of tartar (5%). When shifting the pH, I add small amounts of vinegar (to lower the pH) or washing soda/soda ash (to raise the pH) to a bucket of water, and I use litmus paper to check the level – I think a digital pH reader is in my future! Not every mushroom colour reacts to shifts in the pH level, so it’s best to experiment with small samples first. If you’re lucky enough to find some lobster mushrooms, they’ll give the most striking changes in colour. When extracting the colour from the mushrooms, I bring the pot to a slow boil and keep it at a low simmer for about an hour, then I let the dyepot cool overnight before straining the mushrooms out. 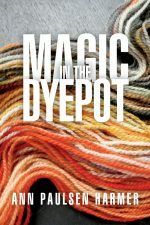 When dyeing the fibre, it’s best to keep it just under boiling, especially if dyeing wool – too much boiling is hard on the fibres. This year I’ve been using an old Crockpot for smaller samples, as I can walk away and leave it for a few hours, without having to check frequently. I belong to a Yahoo email forum called Natural Dyes, and in their archives you can find a great deal of information about mordanting. Will you be teaching a workshop on mushroom dyeing this fall (2011) ? I would love to attend! I’m thinking of doing another workshop this fall, but it would have to be in late October/early November, after our Mushroom Festival on October 15. Whereabouts are you? I’d holdl it here (Garden Bay on the Sunshine Coast), but I like to include a foray or two ahead of time so participants can learn what to look for and where. I’ll keep you posted. Your site gives me hope that I too can learn enough about fungi to die my own yarn. I’m from Tacoma but live in St Louis right now, will be good to get back to the PNW in a few years! Start with what you find around you – you might be surprised at the results! But living in the middle of a rainforest does help when it comes to finding mushrooms. And that’s where I’m headed right now . . .
Will you be going to the fungus among us festival in Whistler on Oct 13 (next weekend)? I would love to chat with you about mushroom dyes! For many years I was the USA Rep. to the International Federation of Fungi and Fibre. Several Symposiums in the Scandinavian Countries, Australila, two in the USA, I was also in Mendicino, and would love to do more and might yet. The past nearly 6 years have been messed up by 11 surgeries to repair or replace body parts that had to have help. But pain never kept me from hunting for those mushrooms. Hopefully this year will see me able to head for mushroom country to find more to add to my books. Glad to have found your “blog” as it is always fun to find like minded people. Folks here in my little town have grown used to me, but most think I am still rather strange to spend time in the mountains looking for something to dye yarns with…………. So happy I stumbled across your blog, it was exactly what I was looking for! I’m currently living in Vancouver and am just getting into natural dyes (particularly excited about fungi dyes), so happy to have some local know how to guide me! In fact, maybe you can help get going… I’m wondering what are some good colorful mushrooms to forage for at this time of year? I know October is typically the big mushroom month… Hopefully I’m not to late! I’m happy to connect, too – how exciting that you’re discovering mushroom dyeing! At this time of year you can still find Dyer’s Polypore (Phaeolus schweinitzii), which grow on big firs (or on their roots) and on mossy stumps and logs. They’re starting to go brown now, but this year’s will still be fuzzy on the underside, whereas last years’s look dark brown and scurfy underneath. The Dermocybes are starting to appear in good numbers now. These are the Cortinarius that have bright orange, gold, or red gills, although they look brown on top. I find these in the moss beds where arbutus grow as well as in mossy areas surrounding mature Douglas fir, and occasionally on rotting logs. If you get a good number, you can separate the caps from the stems and do some comparison dyebaths, and they dry very well if you want to use them later. And you could possibly still find some Lobsters poking up through the duff like big orange fists. I started seeing them in September, so those that are left are getting soft, but their pigment is still good. Good luck with your dyeing, and keep me posted. I’m glad you’ve caught the fungus-dyeing bug! Hi, Jules, and thanks for asking. I’m quite happy to be on your pinterest site – I don’t spend too much time there myself (coordinating the upcoming Fungi and Fibre Symposium is taking up most of my free time now – maybe next year!) at the moment. You have a beautiful blog and beautiful children, who are fortunate to be growing up as they are. I’m sure they’re learning about mushrooms, too! Take care, and one day our paths will cross, no doubt. Hello Ann I and my husband are going to Sunshine cost in October. SEE you ! Hi, Astrid. I’m so glad to hear that – you’re going to love it here! See you in a few months. Hello Ann, I have taken a natural dye class last semester at the Kansas City Art Institute, and I am very very interested in fungi, do you by any chance need an intern? It’s exciting that you’ve discovered dyeing with fungi – it’s a fascinating side of natural dyeing. It would certainly be nice to have an assistant, but my mushroom supply seldom takes me through the entire year because I always have to set some aside for any workshops I might be doing. And this year the mushroom harvest in this area has been minimal, so I plan to experiment with eco-printing and printing with the bits left after the mushroom dyepots are spent. You might be interested in the International Fungi & Fibre Symposium, an event held every two years, somewhere different each time. I coordinated the event here last year (you can see photos here: https://www.youtube.com/watch?v=2bdT91MWAHg&feature=youtu.be), and in 2018 it will be held in Norway, August 13-19. The organizers haven’t put any information out about it yet – I expect we’ll be hearing some time in the new year – but if you can possibly make it, it’s wonderful to spend the week with other mushroom dyers and the best way to learn. I’ll put it on my blog as soon as I hear anything. If you’re interested, you’ll want to register as soon as possible, as spaces will fill up quickly. Haha thank you for the information! I am a Windgate nominee so I might have a opportunity to go! I am looking for opportunities to learn more on fungi and paper so I will definitely look into that! oh no! I am sorry to here about the mushroom supply, however if you do need help, let me know! I would love to assist and/or work with you! Then I hope to see you in Norway next year!